UAF’s College of Engineering and Mines (CEM) hosts an engineering week open house every year in conjunction with national engineers week. The event is an opportunity for the Fairbanks community to discover, engage and enjoy all things engineering. This year’s open house held on Saturday, February 23rd, was attended by approximately 500 people. CESTiCC’s “Making Concrete” activity taught young engineers and their families about the materials that go into building roadways and maintaining traction in the winter. 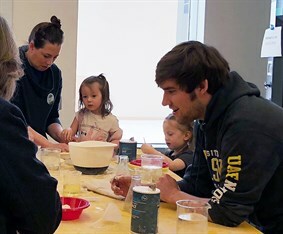 The hands-on component of the activity was making playdough, introducing them to following a recipe, measuring ingredients and mixing the materials togeher to make something new. CESTiCC wishes to express our appreciation to CEM for sponsoring the event and to our CESTiCC volunteers. Everyone had a great time, and we’re hoping it won’t be too long before we see these transportation engineers on campus! Diane Wallace assists her daughters, Hadrian (left) and Deidre (right) Eickermann, make concrete during the Engineering Open House. Matt Encelewski, undergraduate student in Civil and Environmental Engineering at UAF, assists another concrete maker.